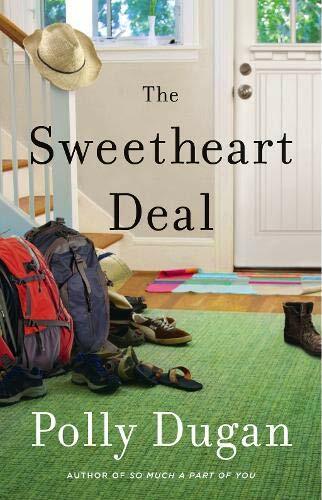 The Sweetheart Deal is a solid first novel by Polly Dugan, which in spite of the sweetness of the title, never strays toward sappiness. This story of loss and redemption opens in the husband’s point of view. Sadly, we never hear directly from Leo again. He dies in a freak skiing accident leaving his wife, Audrey, and her three young teen-aged boys seemingly alone. The crux of the book is not about Leo’s death, however; it’s about a secret promise made by Leo’s best friend, Garrett—an accomplished and enthusiastic bachelor. Under drunken duress 12 years prior to Leo’s death, Garrett signs a slip of paper on which he promises to marry Audrey if she should ever become a widow. At the news of Leo’s death Garrett, who is in a tenure-track job at Boston College, drops everything in his life—including his current girlfriend—grabs the signed promise, and flies to Portland for the funeral. He plans for an extended stay in order to finish the addition to the house that Leo left behind. The rest of the story follows its predictable path, but the writing is crisp and the characters are believable and likable making this a light, pleasant read. What also puts this novel a slight cut above its peers is the way author Dugan weaves together collective and individual grief by shifting points of view, adding depth and poignancy. Each chapter is from a different character’s viewpoint. While Garrett and Audrey are well developed, more time spent with the three boys—and even Leo—might have added the magic to make this novel truly masterful. The sudden shift to a more passive voice in the last few chapters is also disconcerting, causing a notable loss in momentum and leaving the ending a little flat. Dugan is masterful in being true to Audrey and Garrett. She’s succeeded in crafting a heartening worthwhile journey into grief, redemption, and love. The Sweetheart Deal, filled with memorable engaging characters, is a perfect summer read.